Who doesn’t love Mickey Mouse???? Nobody I bet your youngster is as delighted with the Disney and Mickey Mouse shows as you were with the Mickey Mouse Club back when you were a kid. featuring of course the lovable Mickey Mouse. Kids love bold, bright colors and this set captures Mickey with his bright red pants and white buttons and big yellow shoes, just perfectly. These sets are extremely popular so you need to be quick to secure one for your youngster. one standard pillow case measuring 30″ x 30″. 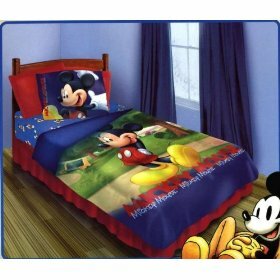 Where Can I Buy a Brand New “Mickey Mouse Main Street” 4Pc Juvenile Twin Bedding Set? 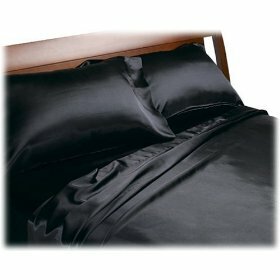 Made from 100% woven polyster satin this Royal Opulence Satin Sheet Set has a beautiful smooth silky feel. The fitted sheet fits mattresses that are up to 17 inches deep. This set is machine washable and is available in ivory, gold and red. This is a good value for money set at under $20 but remember that when it comes to satin sheets you have to be prepared for both you and your pillows sliding around the bed. It has nothing to do with this particular brand of sheets. You will find this will all satin sheets.This all comes down to personal preference however as some people love satin sheets and some hate them. Some consumers have indicated that the red set has the potential to stain clothing a reddy pink color although others that purchased the red set didn’t get this problem. Perhaps it was just a bad batch of sheets. Overall the general consensus amongst consumers was that this was a great value for money set. This set is available in King, Queen, Full and Cal King. 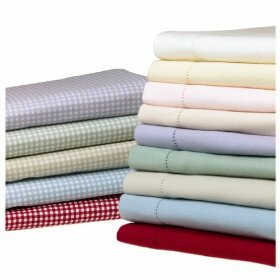 Thread count is a term often used in the bedding industry to describe how fine or coarse a piece of fabric is. You will often see bedding with the words 250 thread count or 1000 thread count for instance. In general, the higher the thread count the better and softer the fabric. The thread count actually refers to how many pieces of thread are found in one square inch of fabric. This includes both vertical and horizontal threads. A good thread count is anything above about 180. Extremely high thread counts of around 1000 are often thought to be misleading. This is because what often happens is that the threads are twisted together to make a plied yarn. For instance, two threads twisted together would make a 2 ply yarn. This means that a sheet with 250 yarns both vertically and horizontally (using a 2 ply yarn) could effectively be rated as a 1000 thread count as it is based on threads and not yarns. To ensure you get the best value for money, when buying bedding look for a thread count from anywhere between 180 and 400. Tommy Hilfiger makes beautiful bedding and this one is one of the best. The Tommy Hilfiger Hyannisport Comforter Set is a 4 piece set is made from 100% cotton. The white piping edge of the comforter and shams gives it a look of style and quality. 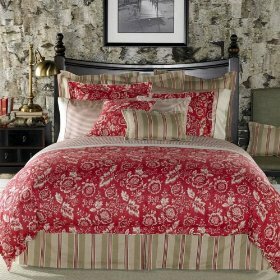 The red and cream floral coordinating colors gives it a striking look and it is finished nicely with a red striped bed skirt. The comforter itself is filled with 100% polyester and is machine washable. The pillow shams zip to close making them easy to remove and clean. This comforter set is available in twin, king, queen, California king and full. I love this range of Disney bedding. The Tinkerbell Pixie Dust collection is absolutely gorgeous and any little girl would love to have this in her bedding. 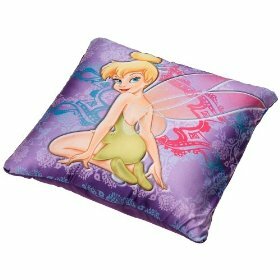 This Disney Tinkerbell Pixie Dust Micro Bead Decorative Pillow is plush and soft and your little girl will be cuddling up to this one. The pillow is made from 100% polyester with a 100% polyester filling and is fully machine washable. This will suit a little girls room in shades of pink or purple or you can buy the whole set of Disney Tinkerbell Pixie Dust bedding. This pillow matches the Disney Tinkerbell Comforter. The pillow measures 14 inches by 14 inches so is just the right size for a little girls bedroom. The Wamsutta Luxury Flannel Duvet Cover is 100% cotton flannel that is soft and cozy in winter and cool in summer. You can use this as a duvet cover in the cooler months and then in summer remove the duvet and just use the cover on its own. This is an excellent quality flannel duvet cover for the money. To ensure you don’t get the problem of shrinkage when washed, the duvet cover is preshrunk and is machine washable. It comes in a variety of colors including white, blush (pink), windstream (blue), laurel (purple), lotus (green), milk and oatmeal. This duvet cover has been napped three times. This means that it has been tripled-brushed to ensure the ultimate in softness. The edge of the duvet cover has been hemmed stitched and fitted with 1/2 inch buttons to seal up the opening. If you have trouble sleeping it could be your pillow. Neck and back pain, difficulty sleeping, snoring and sleep apnea can all be the result of a poor quality pillow. This is where the MEDIFLOW Water Based Pillow comes into play. This pillow provides three levels of therapy – relief, sleep and comfort to ensure that sleep is improved and you wake up feeling refreshed and ready for the day. 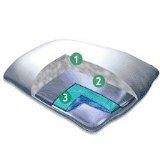 A study conducted by John Hopkins School of Medicine concluded that the Mediflow Water Pillow was more effective than any other pillows tested and this included memory foam pillows. Unlike regular pillows, the Mediflow Water Pillow responds to head movements and adjusts automatically to your particular head shape. It provides continuous support throughout the night and provides outstanding comfort. The firmness level of the pillow can also be adjusted by adding more or less water to suit your personal comfort level. Regular tap water is all that is required. Microsuede is a very popular material in bedding and for good reason. It has all the properties of real suede but is extra soft and feels wonderful against the skin. It is also wrinkle resistant so its perfect for bedding. This SkyBlue Jacaranda Striped Micro Suede Luxury Bed in a Bag Comforter is beautifully coordinated with its sky blue, chocolate brown and camel colors. This would suit both male and female tastes and would work particularly well in a teenagers room. The set is available in King or Queen sizes and is machine washable.